Teams relay race the length of the historic 14th century covered market. Competitors from City law, banking and accountancy firms race around the historic 14th century Leadenhall Market while attempting to flip a pancake in the legenday Leadenhall Market Pancake Race. The winners walk away with free pancakes and the highly coveted frying pan trophy and for spectators there's plenty of pancakes as well as beer and ale on tap at the Lamb Tavern which co-hosts and which is where the race starts. Each aspect of the race allocated to the relevant livery and the Poulters supply the eggs. The City's annual inter-livery Pancake Race sees 21 teams racing around the Guildhall yard at noon on Shrove Tuesday competing for frying pan trophies awarded to the winner of each class. It's a colourful event organised by the Poulters' Company, who supply the eggs - essential in the making of the pancakes - with the support of The Cook & The Butler. Every other aspect of the race is allocated to the relevant livery - the Gunmakers start each heat with a bang, the Clockmakers are responsible for the accuracy of the timing, the Fruiterers provide lemons, the Cutlers plastic forks and the Glovers the white gloves worn by each runner. A recent additional attraction has been a specially commissioned piece sung by the Musicians Company. Original participants were Livery companies in some way associated with the making of pancakes with invited teams from the Mansion House and Guildhall but this has been extended to include other Livery Companies and Corporation Departments such as The Old Bailey, preferably with a relationship to the making of pancakes. Local businesses test their pancake-tossing prowess. The Better Bankside Pancake Day Race at Borough Market's Jubilee Place on Shrove Tuesday sees Bankside businesses team up and showcase their pancake-tossing prowess in aid of a local charity. Teams go head-to-head and the winner is the first team to cross the finish line with more than a third of the whole pancake still in the pan. Teams are encouraged to raise sponsorship and audience members to donate. Pancakes will be available throughout and all race participants will be treated to a free pancake. 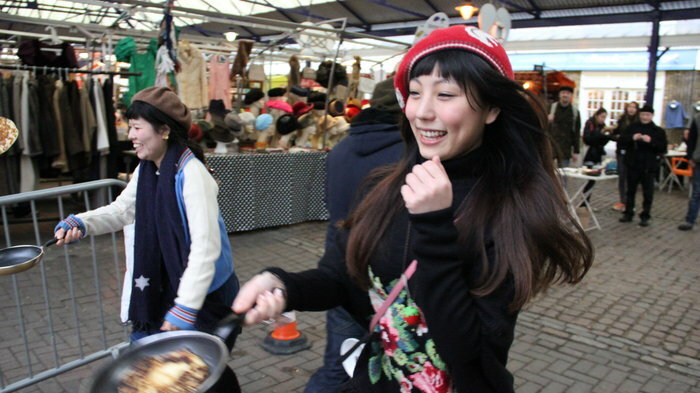 Race around Greenwich Market and get a free pancake. Teams, friends and pancake lovers are invited to join in the Greenwich Market Pancake Races taking place on Shrove Tuesday 5th March 2019 from midday. There are medals to be won and everyone who enters gets a free pancake. Dress up and help raise money for The Greenwich & Bexley Community Hospice. From cheap budget accommodation to luxury 5 star hotels see our deals for hotels, including Grange Blooms Hotel London from 57% off.